Writer/director Werner Herzog’s documentary of the troubled life and death of Timothy Treadwell is an uncomfortable distillation of a self-proclaimed animal activist whose thirteen summers in the Alaskan state-protected park resulted in the deaths of himself, sometime girlfriend Amie Huguenard and the grizzly bear whose natural refuge, like Brokeback Mountain (cross-reference below) was not intended for human campers. 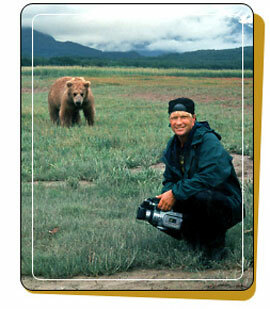 Herzog took Treadwell’s over 100-hour footage (largely self-shot interaction between the reformed alcoholic/drug user and various families of ferocious brown bears and foxes over a five-year period) and spliced in numerous interviews with Treadwell’s relatives, colleagues (many of whom are critical: “[He] got what he deserved;” “You don’t invade others’ territory.”) and friends, but did not once “document” a positive outcome of his subject’s obsession with the wild. There is a short clip from a David Letterman appearance and the brief mention of the Grizzly People Foundation (a charity in name only—according to IRS spokesman Victor Omelczenko it has not been registered as a not-for-profit organization; a Google search shows www.grizzlypeople.com to be a design workshop technology site; www.grizzlypeople.org links to a variety of enterprises—none that protect bears), but actual examples of how the lot of the grizzlies has improved remains as mysterious as Treadwell’s real motivation for living and dying with one of Nature’s strongest warriors. Another brief visit to Treadwell entertaining school kids adds variety to the film but—again—fails to make a convincing case for the value of the publicity hound’s work. Medical Examiner Franc G. Fallico takes near-ghoulish delight in summing up his findings based on the “four garbage bags of people” recovered from the stomach of the unfortunate creature whose only crime was to be hungry. He positively salivates listening to the audio portion from Treadwell’s video camera, which was running throughout the bear’s attack (sadly, it seems, the lens cap didn’t get removed to offer a visual record of the human feast). Gruesome as it must be, this evidence is not shared during the film. We are told that Treadwell is yelling at Huguenard to run away, but whether she was already hurt or standing by her man will never be known. Not surprisingly, her parents declined Herzog’s request for an interview. Throughout, Treadwell revels in his own image and rants against society. He often predicts his own death, begrudgingly admits that gays may have problems of their own (a classic sign of inner angst), and brags of never charging for his services. It is also revealed that he has lied about his background, and—in a too brief moment that, surely, is key to the drama—chooses to return to the park and his deathbed because his airline ticket was discovered to be fake.